Demetria Daniels takes us on a whirlwind tour beyond the pearly gates in Holiday in Heaven, her new musical that was staged in February in NYC as part of John Chatterton’s Second Annual Midwinter Madness Short Play Festival. A lively cast sings us into the rollicking side of angelic living. It’s the end of year 2999 and the Heavenly Council has decreed that the turn of the 3rdMillenium must be celebrated in a special way. Appointed co-chairpersons of the committee, are an unlikely pairing of angelic hosts – Aloysius and Hortense – the English Gentleman and the All-American Girl Next Door. After some friendly bickering, they decide on a Harp Contest, the proceeds of which will be sent to Earth to end homelessness, and the search begins for the perfect judge. Bemoaning the cliquish factionalism that has been dividing Heaven as of late – what with the “intellectuals, radical religionists, third worlders, and even Mother Theresa” - Aloysius and Hortense agree that it would be much more prudent to invite a living human from Earth to judge the contest. The heavenly computer database pulls up names like Madonna but foreseeing the disapproval of the Pope – the winged co-chairpersons set their sights instead on the mousy do-gooder with a sensitive soul, Mary Smith. Sweet Mary helps the homeless, plays the harp, and dates a boorish aloof boyfriend that forgets her birthday and ridicules her for being a dreamer. But before we are allowed enough time to hate on Hank Billings, her boyfriend from gym rat hell, or swoon too long over the shy English pianist that is also trying to hail our Mary, a burst of angelus ex machina whisks our fair lady (via car accident) into the wondrous realms of paradise. In Heaven, it’s Fringe meets the Frogs where unicorns roam free, Matisse is the graphic designer of choice, Jesus and the Apostles chill and play card games, and the fruit trees grow cotton candy and diamonds for all. How could Mary resist the offer for a one-month holiday in Heaven, in exchange for her services as non-factional, sweet, deserving harp contest judge? Well, she doesn’t, and neither would you if on top of all that you finally met the man of your dreams, like Mary does, in the spirit of hunky Alexander the Great. On Earth, poor Mary sang songs of maidenly woe, lamenting the absence of true chivalry…but in Heaven, her long awaited hero is there, in the non-flesh, right before her eyes. But alas – what fate for the love-struck doomed to eventual separation? 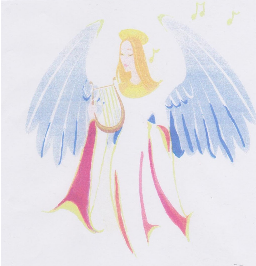 Will Mary’s angelic hosts be able to help? Alexander, claiming he was too busy on Earth to fall in love and get married runs to find his friends Romeo and Juliet as "they may have some ideas." Through boisterous song and dance and witty dialogue, we are taken along on this romantic holiday adventure that asks: do you believe in miracles? And what would you do for a Holiday in Heaven?